The Pediatric Neurosurgery team at American Family Children's Hospital provides treatment for children with craniosynostosis. Sutures (see diagram) are spaces between an infant's skull bones that allow the brain to expand as the infant gets older. Craniosynostosis is a condition wherein two or more sutures have closed too early, which forces the brain to grow in a different direction causing an abnormal shape of the head. 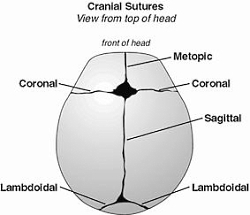 Types of cranial sutures, which close prematurely to cause craniosynostosis. The cause of craniosynostosis is not known. Craniosynostosis is usually diagnosed after parents or the child's pediatrician notice the abnormal shape of the infant's head. Surgery is the most common way to address craniosynostosis. In the most severe cases, the goal of surgery is to create the space necessary for proper brain growth. In mild to moderate cases, the goal of surgery is to make the skull more cosmetically appealing.